Not just in the Olympic games. During the Euro 2012 championship, Italian striker Mario Balotelli was spotted with three tramlines of Kinesio tape on his back. At Wimbledon, Serbian tennis player, Novak Djokovic also had his elbow stripped with Kinesio tape. David Beckham, Tiger Woods and Lance Armstrong are also supporters of the trending Kinesio tape. What exactly is this sticky tape? The Kinesio tape was founded by Dr. Kenzo Kase in 1979 after many years of testing, research and clinical trials. The Kinesio tape helps in optimizing sports performance, reducing pain, aiding in physical therapy, preventing injury, promoting and improving blood circulation. The tape lifts the skin to aid lymphatic flow to help reduce pain. The Kinesio tape prevents excessive protraction injuries by pulling the skin to remind the user not to overextend the injured muscle. Many therapist find that Kinesio taping is useful in correcting movement patterns and improving the posture of their patients. Numerous sports athletes claimed that the tape reduce pain from their injuries and made them feel more confident to train and to compete in games. The Kinesio tape is made of cotton fiber with an acrylic heat-activated backing which can remain attached to the skin for up to five days. The tape is highly adhesive and hypoallergenic. The materials used in the manufacturing are all natural and contain no chemicals. So, it can be used without worrying about the side effects from the chemicals in the ointments or medication. The Kinesio taping method allows the application of the Kinesio tape in a specific way to create a change in the biomechanical movement. Practitioners can be certified by The Kinesio Taping Association (KTA) after learning the correct techniques of taping. 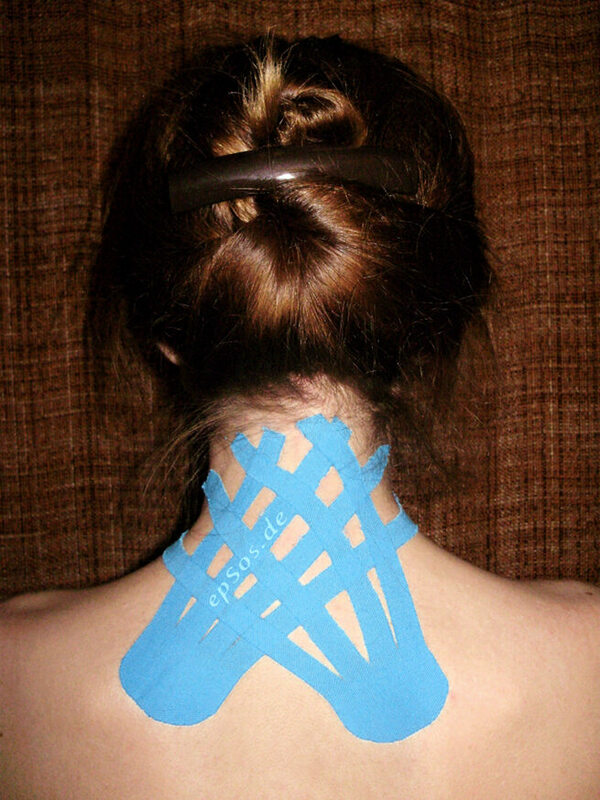 Hence, those who are interested in getting a Kinesio tape treatment can be assured that their therapist are fully qualified to do a correct job. This colorful tape has also become a fashion statement. The influence of David Beckham and Serena Williams had their tapes adhered in a stylish and eye-catching manner. The tapes are also seen beautifully stretching across the belly of the German volleyball player Katrin Holtwick. It caught the attention of all of the spectators at the game and was hugely featured on TV too. This has become the next generation of tattoo art. Unlike the conventional tattoo, it is removable and has striking colors. It is also believed that as more people know about the great use of the Kinesio tape, more designs will be created. Although a few specialists and doctors are skeptical about the wonders of the tape, it is unarguably a method worth giving a try. After all, athletes who are one of the first to use the tape extensively have been happy and satisfied with the effects it has brought to them thus far.